Disclaimer: I do not endorse all opinions on all sites found in supporting links. This article is another of those times when several things came together for me that had been in the works for a while. I think God does that, just brings things together like that. The Arabic letter that begins their word for Nazarine has become a social media event. Moslems are using it to mark the homes of Christians in Iraq (if there are any left there now), which is reminiscent of the way Nazis marked property belong to Jews. People are using this symbol and variations on it in social media to express solidarity 1. However, this is not anything new or unusual. Persecution of Christians is happening worldwide, especially in atheist and Moslem countries. 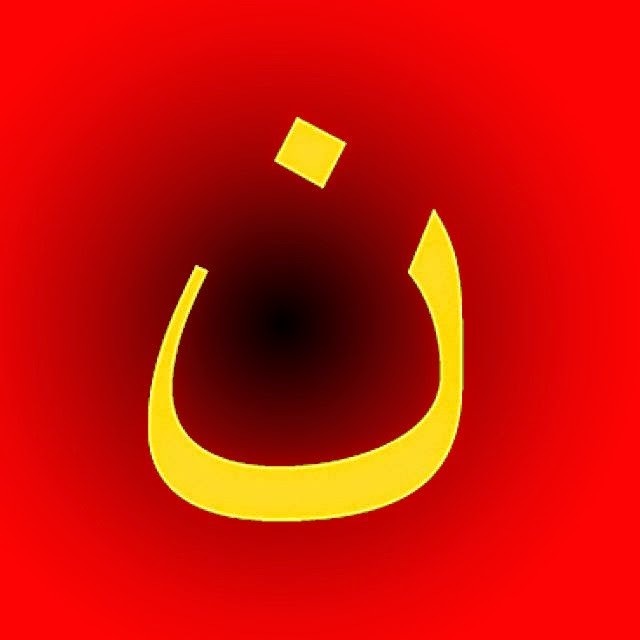 There are ministries dedicated to spreading information and giving support to the persecuted Christians 2, 3, 4, 5. Some of the threat to Christians is the increased Islamization in the West, but the more current threats are from militant atheists and secularists. Currently, blatant physical persecution of Christians in Western countries is rare. It is primarily done as discrimination, hidden behind other excuses (such as poor job performance, or daring to publish information that questions evolution in peer-reviewed material 6). I have documented many instances in this Weblog of atheistic discrimination and persecution. (Some dishonest atheists claim that Christians are not being persecuted, and that they are instead! Ironically, William Murray, the son of famous misotheist Madalyn Murray O'Hair, leads the Religious Freedom Coalition 7.) Although what we endure in Western countries is much milder than our brothers and sisters in Christ are facing in other parts of the world, be certain that it is coming our way 8, 9, 10, 11. 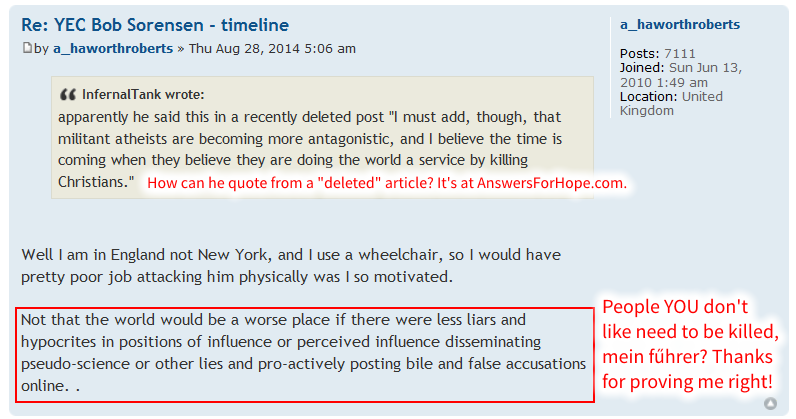 As I mentioned before, there is not much "I'm persecuting you because you're a Christian". Instead, there are excuses and false charges used as excuses to harass, imprison, torture and murder Christians. A good part of this is done by labeling. Sometimes it is with "criminal" charges, some labels are as vague as "enemy of the state" or "child abuser" (Clinton Richard Dawkins likes to equivocate and call Christians who teach their values to their children "child abusers", for example 12). One reason I believe that many atheists hate Christians who teach creation is that we want to encourage people to think critically and examine the evidence instead of simply believing what "scientists say". This also slows atheists down when they want to defame us by appealing to people's emotions with illegitimate, loaded-term labels. Persecution and discrimination begin with words. "More and more people are having a hatred for Christians . . . People behave in a manner consistent with what they believe. If they believe that Christianity's okay . . . they're going to behave very much differently than someone who believes Christianity is a hate-mongering, filthy religion that needs to be destroyed. People with different belief systems are going to behave in different manners based on the belief system that they have. We behave in a manner consistent with what we believe, not with what we don't believe. I have seen an increase in hostility towards Christianity from all types of groups..."
Now I am going to give an example of some of the nonsense that I frequently deal with (which is about 1/100 of what major creation ministries constantly endure). This character is inconsequential and cannot harm me (and I dislike indulging his craving for attention), but his libel illustrates what Paul Washer and Matt Slick are saying 13. Remember, persecution and discrimination begin with words. Words express thoughts and attitudes. People appeal to emotion 14, get others on "their side" and things escalate from there. It has happened before in history, and it is happening again. We need to stand firm and remember what God has told us in his written Word (Matt. 5.10-12, Matt. 24.9, John 15.20, Acts 8.1, 1 Cor. 15.9, 2 Cor. 4.8-12, 2 Tim. 3.12, 1 Peter 2.19-20, Psalm 14.1, Prov. 1.7).